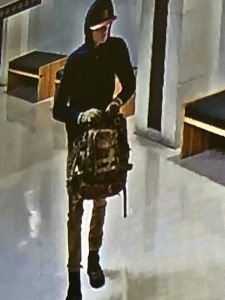 LOGAN — Utah State University police have arrested a 20-year-old man who allegedly tried to rob a convenience store inside the Taggart Student Center Thursday night. Brendan Olsen was booked early Friday morning into the Cache County Jail. He is being held on suspicion of robbery, a first-degree felony. Surveillance photo showing the man suspected of robbing the USU Quickstop, Thursday night (Oct. 11). Police report the attempted robbery occurred at the Quickstop, around 6:15 p.m. Olsen allegedly told the clerk he had a weapon but not brandish it. He was wearing a camo hat, hoodie and khaki pants. Utah State University sent out a Code Blue alert later to warn students of the attempted robbery. Police were able to obtain security camera footage from inside the student center. It showed a man matching Olsen’s description carrying a backpack, walking through the halls. In another photo, he is seen wearing a Halloween-type mask. Olsen is being held in jail on $10,000 bail. Formal charges are pending the completion of the investigation.